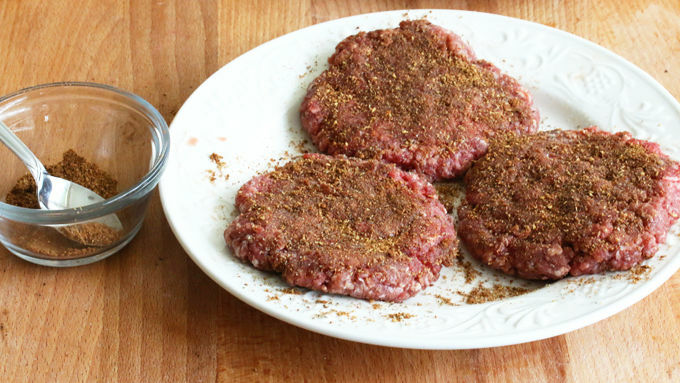 Rub each side of each beef patty down with 1/2 teaspoon Five Spice Powder and salt and pepper. Set aside until ready to grill. 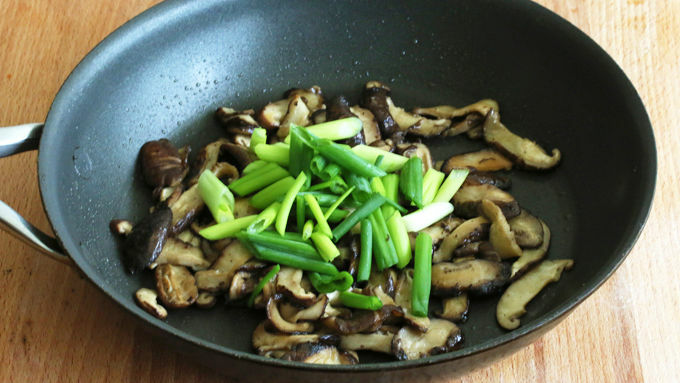 To prepare the mushroom topping, heat the oil in a small skillet over medium-high heat and cook the mushrooms until soft. Add the green onions and sesame oil and cook for another minute. Season with salt and pepper. Set aside. To prepare the Coconut Curry Sauce: Heat the oil in a small saucepan over medium high heat and cook the garlic and ginger for 2 minutes. Add the curry paste and cook for another minute. Add the remaining sauce ingredients, stir to combine. Bring to a boil, reduce the heat to low and simmer for 10 minutes or until thickened, stirring regularly. Keep warm. 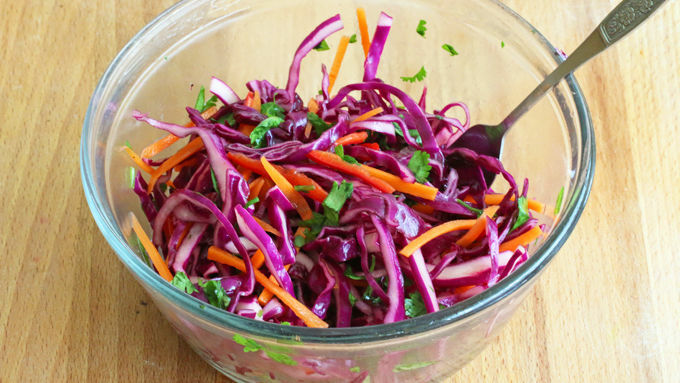 To prepare the Asian Coleslaw: Combine the vegetables in a medium bowl, combine the liquid ingredients and pour it over the vegetables. Toss to combine. Set aside. Heat the grill to medium high, brush the grates with oil and grill the beef patties for 3-4 minutes on each side or according to desired doneness. To assemble the burgers: Lightly toast the hamburger buns on the grill. 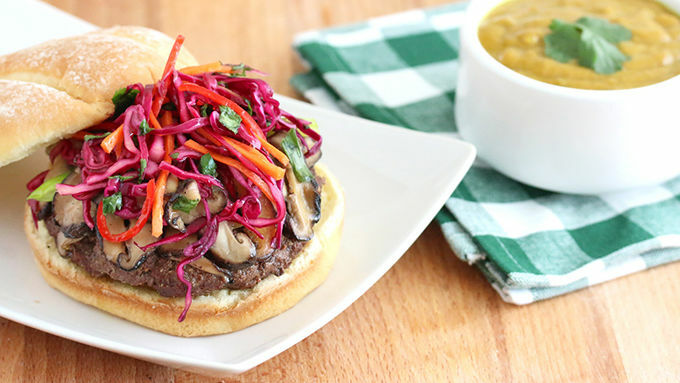 Place the beef patties on the bottom bun, top with some of the mushroom mixture; place some Asian Coleslaw on top. 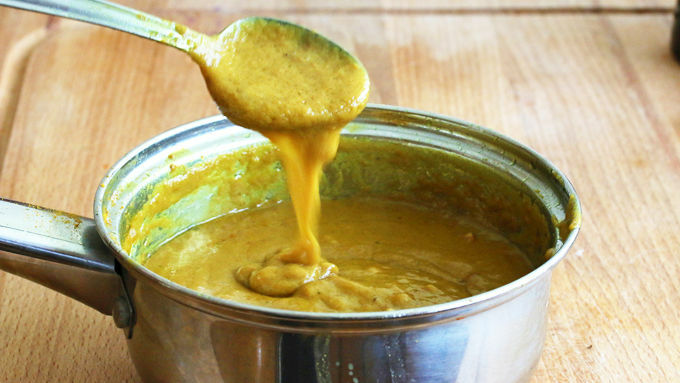 Either spoon some Coconut Curry Sauce over the burger or serve on the side for dipping. The sauce can be made in advance to save time. The beef patties can also be seasoned in advance. The Asian Coleslaw can likewise be made in advance, but the longer it sits the less crispy it will be. A killer combination of Five Spice powder, crispy Asian cole slaw and a creamy curry sauce means these burgers are sure to become a dinnertime fave. Almost everybody loves a good burger. After all, what's there not to like? You've got your meat, carbs and veggies all in one. Burger joints have been trying to outdo each other for decades, coming up with all kinds of combinations. The sky's the limit on the kinds of creative burgers that can be found across the country. Just to give you an example, my husband and I recently went out to a restaurant that featured the "Dead Elvis Burger". It's certainly a catchy name. What was on it? Candied peppered bacon, fried banana, over-easy egg, creamy peanut butter, and mayonnaise. Of course, all of those ingredients are just fine individually...but combined? I didn't have that kind of courage! Today's burger is one that won't require any courage on your part – just a good appetite for a great burger. The beef patties are rubbed down with a deliciously mysterious Five Spice powder, grilled to perfection, and then topped with sautéed shiitake mushrooms and green onions, a crispy Asian coleslaw, and then slathered with a creamy coconut curry sauce. We're talking a burger on flavor steroids! Your taste buds won't know what hit them. But they'll be happy. Deliriously happy. 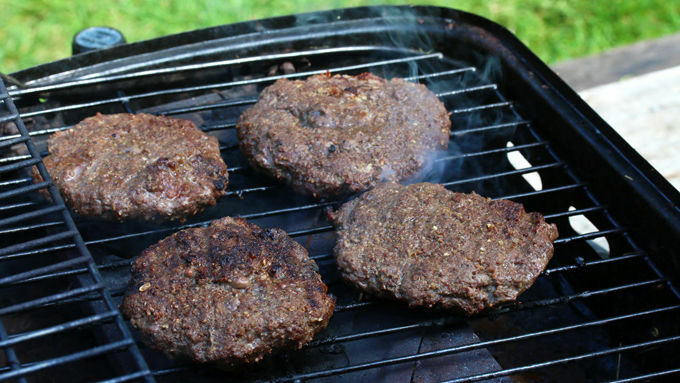 To assemble the burgers, lightly toast the hamburger buns on the grill. Place the patties on the bottom bun; add some of the mushroom mixture. Place some of the Asian coleslaw on top. Serve with some of the coconut curry sauce. You can either spoon the sauce over the top or serve on the side for dipping. Enjoy!